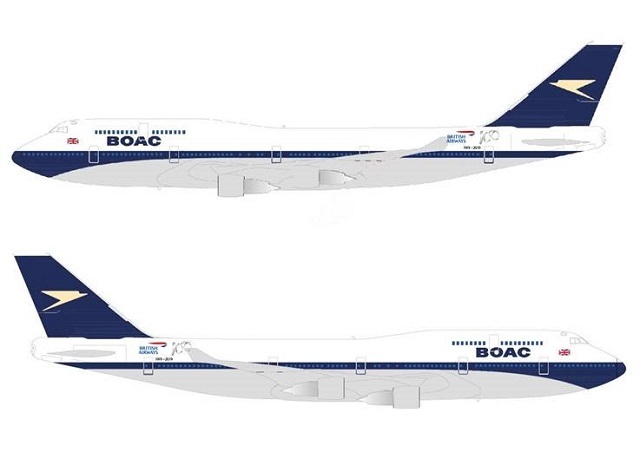 British Airways will unveil a Boeing 747-400 "retrojet" next month adorned in the colours of its predecessor airline BOAC, as part of the airline's centenary celebrations. The UK carrier says that one of its 747-400s – registration G-BYGC – will arrive at Heathrow from the paintshop on 18 February in the BOAC scheme, and that the livery will remain in place until it retires in 2023. It says that the 747 will be the "first aircraft to receive [this] popular design from British Airways' past with more details of further designs to be revealed in due course". However, BA says that all new aircraft entering the fleet, including the Airbus A350, will continue to be painted in the current "Chatham Dockyard" union flag design. "So many British Airways customers and colleagues have fond memories of our previous liveries, regularly sharing their photos from across the globe, so it's incredibly exciting to be re-introducing this classic BOAC design," says Alex Cruz, BA chairman and chief executive. "Our history has shaped who we are today, so our centenary is the perfect moment to revisit our heritage and the UK's aviation landscape through this iconic livery," Cruz adds.